Now this is what a low-budget post apocalyptic film is supposed to look like. This is one of those rare occasions where the film actually lives up to the badass poster art, and considering how low-budget this film is, it's all the more reason to be pleasantly surprised. I have to give it to Full Moon head honcho and Metalstorm director Charles Band, while he hasn't always turned out memorable films or entertaining ones, his directing duties here are pretty damn impressive. Forgoing any kind of logic or inventiveness, director Charles Band instead decides to go for sheer fun and excitement, never mind that it doesn't make any sense or even wrap up to an actual conclusion. It is what it is, 100% low-budget cheesy fun. I really had a lot of fun with this one. Low-budget post apocalyptic films were a dime a dozen back in the 80's, and though a majority of them came from the Italian market, there were a few notable American made films that made an impression. Spacehunter would be another notable example, as well as Escape from New York and a slew of others, but this one from low-budget producer extraordinaire and sometime director Charles Band certainly delivers the goods. It doesn't make a whole lot of sense, and the production value looks almost non-existent, yet it's put together so well, with such a professional touch that you just can't help but enjoy it. Throw in Richard Band's "better than it ought to be" huge, thunderous and downright catchy score, the very decent cast, some downright weird and trippy sequences and a visual competence that raises it heaps above the competition and you have one of the best and most entertaining post apocalyptic films to come out of that era. This was intended to be in 3D, which is how it was originally released as you can tell by many of the "shoot at the camera lens" gimmicks found throughout, and I really would have liked to have seen it that way too as it looks like it would have been a lot of fun. But seeing it in regular 2D doesn't take away from the experience thankfully. Though the 3D gimmickry is what I'm sure sold the idea, what works in this films favor is it's brisk pace. It never slows down enough to be dull and throws enough action, car chases and weird mystical sequences in it that above anything else, keeps you entertained. A lot of it makes absolutely no sense, like the title for instance. 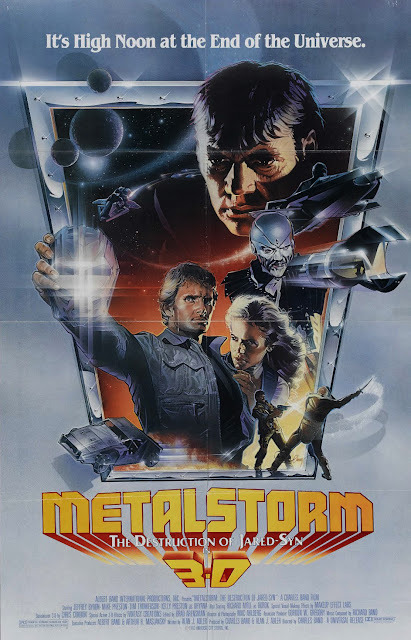 What the hell does Metalstorm mean anyway? Or even some sequences in general, like when the main character Dogen is chasing the villain of the film, Jared-Syn, and somehow open a portal into another dimension (how the hell do they even know they can do that or even how?) at the end of the film, or even how said villain Jared-Syn is somehow able to be the leader of a large group of people "just because". I mean, they follow his rule but we're given no cause or reason as to "why" they do. They just do because he wants to be the ruler of the land. As far as story goes, I'm gonna try what I think resembles the story. Something to do with a crystal and the villain of the film needs it to be able to take control of the land or something like that. He uses his army of cyclops, nomads and whatnot to dispense his version of the law throughout the land and to keep the people in line. Meanwhile, a seeker by the name of Dogen (Jeffrey Byron) rescues a woman (Kelly Preston) after her father is murdered by this band of thugs and Dogen (for some strange reason) promises to exact revenge on these people for someone he's never even met. The cast is certainly entertaining. You have a very young Kelly Preston as the only chick in the film, who Dogen promises to protect and exact revenge for the death of her father. You also have the always awesome Tim Thomerson in a far too short supporting role as a guy who Dogen seeks help from in order to reach his destination. And along for the ride is Richard Moll as the leader of the cyclops who spews out ridiculous dialogue with such ease that it only proves once again that he was made for films like this. All in all, a very sleek and entertaining low-budget yarn with some pretty cheesy, but nifty special effects and an above average quality. Definitely worth checking out if you ever get the chance. I haven't checked to see if this is available on DVD in 3D, but that would definitely be something worth checking out. Even with the cheap 3D glasses, I think it would be a helluva lot of fun. I'll have to check this out, it looks pretty sweet! I didn't really have any high expectations going in, but it ended up being so much better than I was expecting. Definitely one of the best films of this genre out there. Be forewarned, it's a little weird and a lot of it does't make sense, but who cares. It rocks! Yeah, this was a bit of a miss for me. Watched it last year and fell asleep during it. 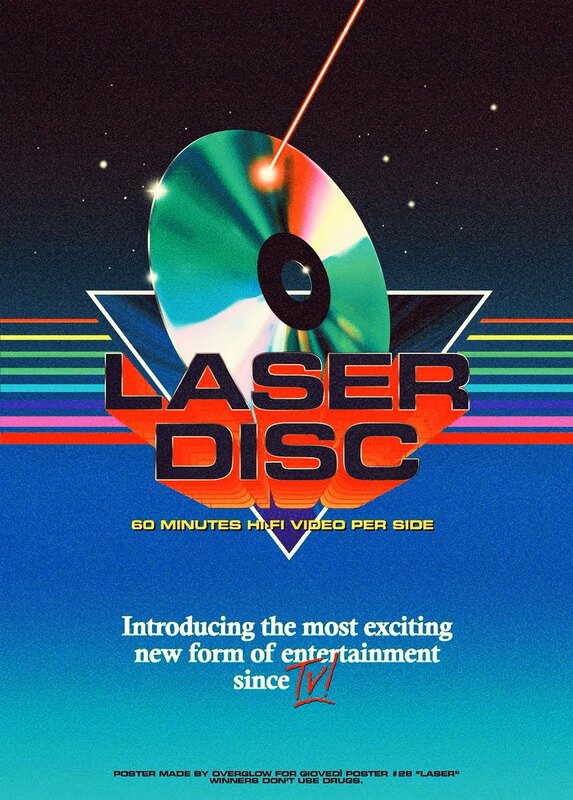 As far as I know no 3D Dvds exist, which is a shame because it probably would have improved it a bit. Yea, you know it's not the greatest movie, but after all the lame low-budget post apocalyptic films I've seen recently, this one had a charm to it and maybe it was just the music or the better than average filmmaking, but I dug it. It didn't make a whole lot of sense, but it had a fun vibe. I wouldn't buy it or anything, well maybe if they had it available in 3D, but it's not worth a purchase.